Q: What toy should I buy for a beginner dog? A: There is no simple answer to your question. Does your dog like real fur or fake fur? Does your dog like balls? Does your dog prefer treats rather than toys? What is your dog's size? What dog sports do you participate in? It’s always nice to have a variety of different toys to determine what toys your dog likes and also, dogs can get bored with the same toy. A: We don’t always have the exact faux fur in the solid colors as shown in the product listings. Sometimes, for example, the purple is dark, sometimes it's a vibrant purple; blue might be light or dark. If previously you ordered tunnel bags or Dry Beds and you reorder, the color may not be a perfect match. We have no control over this. Q: Why do you sell only rabbit, sheepskin and buffalo? A: We use only furs that are recycled bi-products of the food industry. The rabbit comes from Spain, the sheep shearling from the USA, buffalo from a Canadian ranch and all are raised for their food value rather than their hides. As a matter of conscience, we will not use furs from animals that are killed for strictly their hides (coyote, fox, raccoon etc.). Q: How are your real furs tanned and dyed? A: Both the rabbit and sheep shearling are “eco” tanned using alum. Our rabbit hides are all natural – no dyes – and the sheep shearling comes from U.S. farm-raised sheep is vegetable dyed in the USA. Buffalo is fully organic, all natural. Our Icelandic Sheepskin (T-R Tug) is eco-tanned without the use of heavy metals. The exact formulation is a trade-secret but the tanning meets European Union regulations for an environmentally friendly tanning process. Q: How do I care for my 100 Washes Bed? A: These beds won't compress and they retain their shape. Wash in cold water, machine dry on "cotton" (hot) setting. We wash our pups beds once a week and have done so for many years. Every the light colored fabrics come out of the dryer looking new. Q: Are your toys indestructible? A: No toy is indestructible. We guarantee all our products against manufacturing defects and our quality control level is exceptionally high – we have had very few failures. There is no way that we can guarantee the webbing from tearing or fur from shredding or ripping. Some toys claimed to be indestructible are really tough on your hands or not comfortable to hold onto. We are dog owners that actively participate in dog sports. We know about the importance of toys that are comfortable and safe for you and your dog. Provided your dog isn’t allowed to chew our toys, they are built to take abuse. Our tug toys are meant for interactive tugging between you and your dog only. We strongly recommend that you do not allow your dog to play with the toy after interaction has ended. If you let your dogs use it as a chew toy, it will be destroyed. Q: Can I wash your toys? A: All our toys are washable. Toss your toys in a pillow case or our custom Wash Bag and machine wash, gentle cycle in cold water and hang to dry. Q: What currency is this website? A: If we have the items in stock, most orders ship within 1 to 3 days of receipt, excluding weekends and holidays. Custom work, such as X-Pen Covers and Sides and Crate Covers that are made to order, usually ship within 7-14 days. We will make every effort to keep you informed about orders that may take a little longer than normal to ship. A: All products are 100% guaranteed against manufacturing defects. For complete details, read our Guarantee Policy. 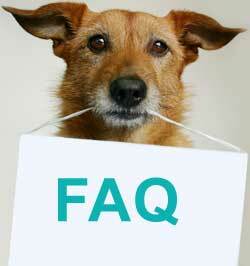 Q: Questions about your order or need product information? A: We're here to help you. See our Contact Us page for information on getting in touch with our shop. Q: Don’t see what you’re looking for? A: Our customers are an important source of design input. We can custom-make anything you require. If you can’t find what you are looking for on our website please call or email us and we will be happy to provide a quote. Stay in Touch We would love to hear from you with feedback, suggestions or a simple hello. Please email us or call 705/879-4235.